What does John Dillinger, the notorious gangster of the Prohibition Era and the Great Depression, have in common with Olympia? We have to go way back, so stay with me on this one. John Dillinger was the reason J. Edgar Hoover formed the FBI. The government needed a way to start cracking down on organized crime in the 1930s, and Dillinger’s gang was the biggest thorn in their sides. He was responsible for two-dozen bank robberies, four police station robberies, and the homicide of one police officer. He was known to be wild and proud of his crimes. Dillinger died in a shoot-out with police in 1934. Dillinger got his start in the world of crime in the 1920s, a time known as the Prohibition Era – think “The Great Gatsby.” It was a time of flapper girls and secret bars (speakeasies) where alcohol was served illegally. 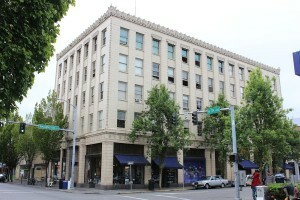 Dillingers Cocktails and Kitchen, located at 404 South Washington in downtown Olympia, is housed in the old Security Bank Building, which was built in 1927. The building is on the corner of Washington and Fourth Avenue and was so tall in comparison to the other buildings at the time, people referred to it as a skyscraper. It’s a whopping five stories tall. 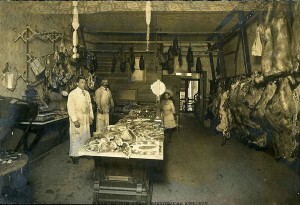 Prior to the Security Building’s construction, the corner was home to Chambers and Swanton Meat Market, a full-service butcher. The Security Building sits on over 300 pilings over filled-in tidal marsh. The building’s designer was Abraham H. Albertson, an architect from Seattle who primarily designed buildings for the University of Washington and who also designed Cornish College of the Arts. The Olympia-based construction company known as the Dawley Brothers, which was owned by Leo and J.M. Dawley, constructed the structure. They also built the Hart-Dawley house in the South Capital neighborhood, which was the home of Governor Louis Hart. The Security Building was built in the Sullivan-esque Style (think rosettes and pineapple details) and boasts nothing but the finest materials available at the time. There is marble from Europe and granite from Canada, not to mention prized mahogany from the Philippines throughout. The structure has remained sound all these years later, even though it’s built on fill over the natural location of tidal marshes, it rests on hundreds of pilings, and it has weathered two major earthquakes. 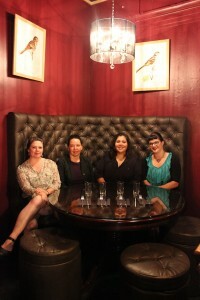 The ladies behind Dillingers’ success: (from left) Sandy Hall, Lela Cross, Denise Alonso, and Sherilyn Lightner. The style of the building certainly makes an establishment like Dillingers seem like it truly belongs there. Dillingers is owned by Lela Cross (of the former culinary gems Capitale and Cielo Blu), Denise Alonso (who formerly ran the bakery at Saint Martin’s University), and Sandy Hall (formerly of Batdorf and Bronson). “There’s nothing that compares to the fun, the vibe, or the stress of owning a restaurant,” says Hall. Dillingers is full of swank. 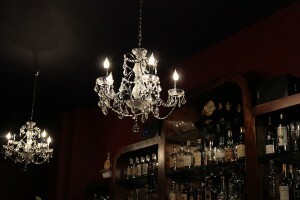 There are bold chandeliers and dark walls with custom-made wallpaper in places. There is a gorgeous bar, designed by Hall, that’s high on gloss. Everything is plush and fancy. After leasing the space, Hall’s father took one look at the original teller’s booth and into the old bank vault in the back and declared that it brought to mind the days of John Dillinger. Thus, downtown Olympia’s melting pot of hipsters, legislators, and all kinds of people in between was given its name. “The customers send us things about Dillinger all the time,” says Cross. The old bank vault and the name helped shape and guide the vision Alonso, Cross, and Hall had for the establishment that opened this past winter. In a building with 1920’s architecture and a name harkening back to the time of bank robberies, and gin joints, there was only one direction to go: Prohibition Era cocktails. The Prohibition Era is known more for cocktails than food, so the owners were free to bring in their own favorites when it came to planning a menu. The seafood is a nod to Olympia (and supplied by Olympia Seafood Company), while dishes like red beans and rice are reminiscent of Houston, from which Hall originates. Cross is from New Mexico, and she likes colorful foods. Hot Babe Hot Sauce is sourced from Sandra Bocas in Yelm. 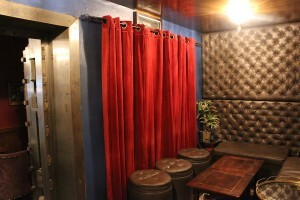 The Security Bank Vault is Dillingers most-requested area for reservations. The authentically-crafted cocktail menu is divided by the darlings of the Prohibition Era: whiskey, cognac, gin, rum, tequila, champagne, wine, beer, and hard cider. Dillingers uses spirits from local distilleries and breweries. You can, of course, order whatever kind of cocktail you want. But why would you do that when you can put yourself in the hands of these master cocktail craftspeople and drink something called a Mary Pickford, named after America’s first sweetheart of film, instead? Blood and Sand: Cross loves this bright nod to the Rudolph Valentino film of the same name. Many of Dillingers spirits are sourced from local distilleries such as Wishkah River in Aberdeen. 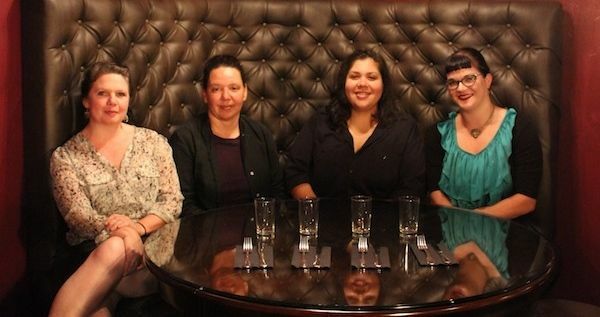 Next up for Dillingers is their “Gin Punch Brunch,” which premieres September 14. They also have an artist-of-the-month. Pairing up with the community is clearly important to Dillingers. “I really love the way people come together here. They end up making friends or running into people they haven’t seen in years,” shares Hall. While it’s true that John Dillinger never set foot in Olympia, it is also true that you are not John Dillinger. Lucky for you (for lots of reasons), because that means you can enjoy Dillingers Cocktails and Kitchen – perhaps even tonight. You can learn more about Dillingers by visiting their Facebook page or their website.